In the end four second half touchdowns by Jaylen McRae was too much to handle, as the Tigers rallied late but fell short in a 27 – 29 loss to the Hurricanes at Homecoming. The hosts celebrated former player Bob Lewington before the game and rode a rowdy atmosphere to a 13 – 0 lead at halftime – but in the second half it was stand-out player McRae who dominated and scored 4 touchdowns. A late rally saw the Tigers fall just short after a flag on 3rd & 2 with less than a minute to go negated a first down and stalled the offence. 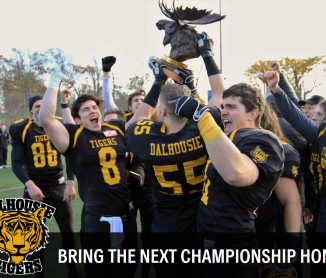 The Tigers will head on the road next week to play either UNB Saint John Sea Wolves or the UNB Fredericton Red Bombers, with final rankings still to be finalized by a tie-break.